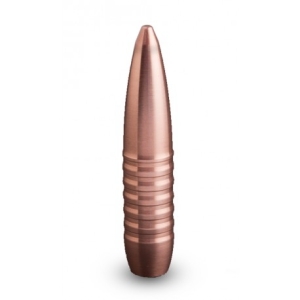 Peregrine Bullets’ Solid Copper reloading bullets, are non-expanding meplat red copper monolithic bullets. This is a hunting bullet even though it is non-expanding. It can be used as a softer alternative to the Peregrine Solid Brass reloading bullets (VRG1) in exactly the same application as a professional hunter backup bullet for both double and bolt action rifles with velocities less than 2700 fps. Solid Copper reloading bullet is officially recommended as the better option for double rifle applications. It is softer on the twin barrel structure and will yield a longer barrel life. Barrel separation which is quite common on double rifles is adversely affected by the prolonged use of brass bullets. 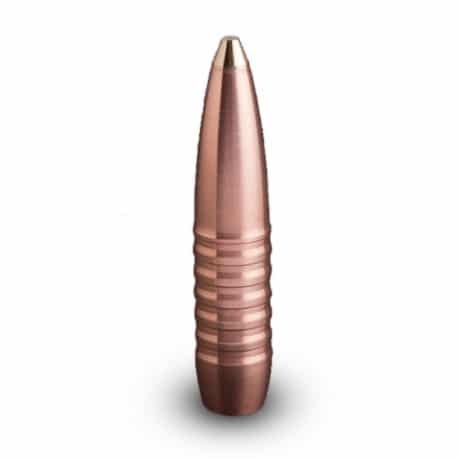 This solid monolithic bullet does not fragment on impact and the meplat nose makes it ideal for application in the thicket and where overpenetration is required on dangerous game. The Peregrine Solid Copper can also be utilized as a perfect twin of the Peregrine BushMaster (VRG3) with near exact ballistic properties. It is also a cost effective alternative to the Peregrine BushMaster (VRG3) since it is non-expanding and therefore does not contain a plunger. The cost saving benefit is useful for load development, target shooting and practice purposes.